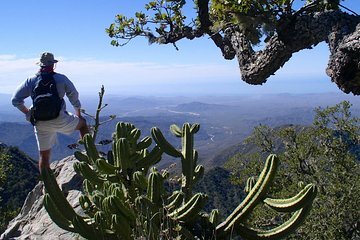 Embark on an adventurous mountain hike in one of Baja's more remote areas: the Sierra de La Laguna Biosphere Reserve. Set out from Todos Santos for this full-day trek alongside an expert naturalist who will fill you on the diverse flora and fauna—much of which in endemic to the region—en route. Hike from desert scrub up through verdant oak and pine forests, learning as you go. Your goal is to climb as high and possible before the sun sets, so prior experience is highly recommended. This tour was fantastic and very challenging. The trek involves climbing about 3,000 ft 900 meters through desert trails towards the peak of the biosphere. Our guide was fantastic and brought extra water for us, which we definitely needed. The lunch they provide halfway through the hike was outstanding and felt well earned. If your goal is to summit the peak of the biosphere, you will need to arrange a two day one night trek, as it is next to impossible to summit and return in one day. We plan to summit the peak the next time we visit Baja. Mauricio was our guide and was very knowledgeable about Flora, fauna, and history of Mexico! The lunch torta's were excellent! Booking again for a larger group of hiking friends next year!